Position rack in center of oven, and heat oven to 400F. Combine the braising liquid ingredients in small jar or bowl. Stir until sugar and salt are dissolved. 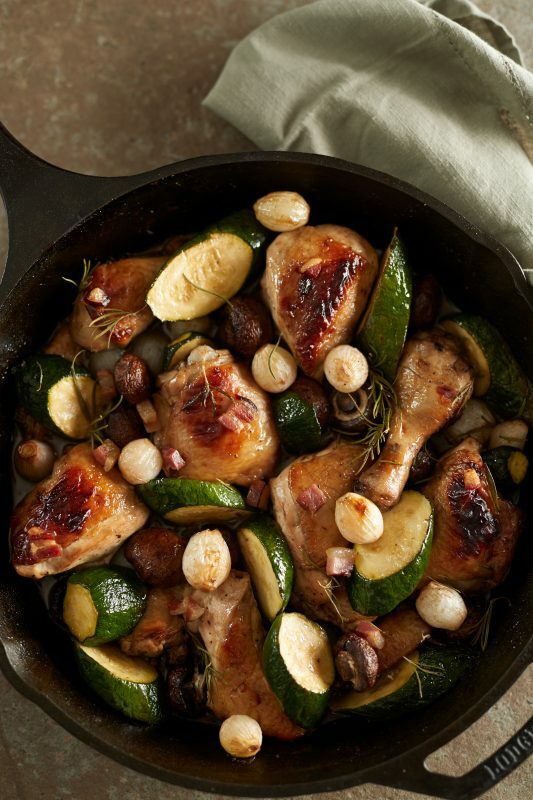 Arrange chicken, onions, mushrooms and pancetta in a large cast iron skillet or oven proof casserole dish. Pour the braising liquid over the chicken, onions, mushrooms and pancetta then use a brush to make sure the liquid coats everything. Add the red wine or chicken broth. Remove from heat and tuck zucchini slices around chicken and brush with pan juices. Continue baking until the largest chicken piece reaches 165F and the zucchini is tender (approximately 15 – 20 minutes). Serve with oven roasted potatoes, or crusty bread, and a green salad. *Note: trim off excess skin and fat. If using chicken breasts, cut each in half width-wise.